North Texas saw heavy rains and plenty of lightning Sunday night. Thunderstorms rumbled across North Texas on Sunday night, dropping rain and hail. 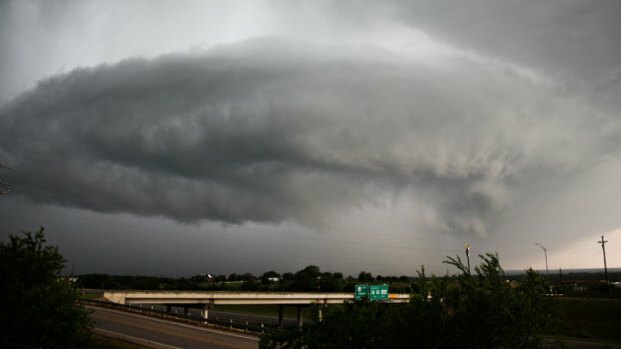 The National Weather Service has issued severe thunderstorm watches for much of North Texas, including Collin, Comanche, Dallas, Denton, Eastland, Ellis, Erath, Fannin, Freestone, Grayson, Henderson, Johnson, Kaufman, Lamar, Limestone, McLennan, Navarro, Rockwall, Somervell, Tarrant and Van Zandt counties, until 4 a.m. Heavy storms began moving into Tarrant County shortly before 7:30 p.m. and moved eastward before exiting the Metroplex late Sunday night. There is lingering chance for additional storms overnight but most of the Metroplex should be quiet. But more late-day thunderstorms could develop on Monday. The storms are brought lightning strikes and heavy rain, as well as hail and strong wind gusts. Quarter-sized hail was reported in Haltom City, with smaller hail reported in Grapevine. Earlier, golf-ball-sized hail was reported in Montague County. Tornado watches issued by the National Weather Service for numerous North Texas counties expired at 9 p.m. Some funnel clouds were reported, but no tornado touchdowns or severe damage were reported. You can follow NBC DFW meteorologists on Twitter @NBCDFWWeather and by using the hashtag #dfwweather.